Soak dry fish in water for 1 hour. Remove the head and intestine part. Clean it properly and wash in running tap water. Wash all fish thoroughly to remove mud and dirt. To remove that odd smell, cook it in enough water for 10 mins on medium-low flame. Remove from the heat and allow to cool. Drain the water completely and keep cooked nethili aside. Cut tomato and grind it in mixie to smooth paste. Keep it aside. Grind grated coconut in mixie along with 1/4 cup water to smooth paste. Keep it aside. Heat oil in a pan or kadhai. Temper mustard seeds, fenugreek seeds and curry leaves. Add chopped onions and green chilli. Cook it for a min on low flame. Add ginger-garlic paste and tomato paste. Saute a while. Add coconut paste and stir a while. Add brinjal, chopped broad beans and mochai. Mix everything well. Add tamarind water, turmeric powder, red chilli powder and coriander powder. Add salt to taste. Add 1/2 cup water or more if needed. Cook it covered for 10 mins till masala is cooked well. Now add nethili and cook it covered for another 10-15 mins. Serve hot with steamed rice or ragi kazhi. If you want to cook it in pressure cooker, then add the curry in cooker and cook for 2-3 whistles. Once pressure settles, add cooked nethili and cook for another 10 mins without using weight. Cooking raw nethili for 10 mins is optional but it helps to remove that odd smell. You can also skip this step. 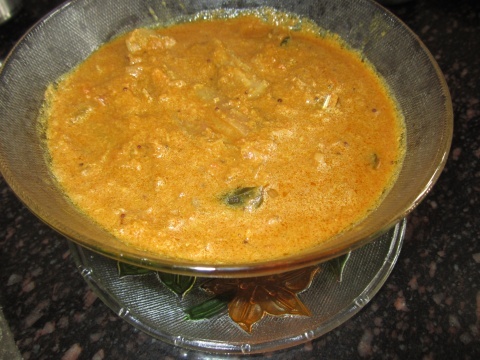 This curry can be used for 3 days if coconut is not used. Since we are using coconut here, keep it in refrigerator and serve within 2 days. Dry fish is my all time favorite…u have lots of recipes using dry fish…lovely n yummy.Happy following u dear.